"Fantastic service, from quotation, delivery, quality and reliability of products and collection. Highly recommend and thank you RadioFacilities - we will definitely be using you again next year! " "Fabulous service from start to finish. Thank you so much!" "We have hired radio mics from Radio Facilities every year for our school productions since 2015 and we have always been totally happy with the service they provide. Prompt replies to any enquiries, high quality kit hired out, set up professionally and working perfectly (not easy with 11 radio mics), very fast remedies for any equipment glitches during the hire period - and a great competitive price. Thanks Radio Facilities!" "Great service - highly recommended! All kit comes ready to go, so couldn't be easier!" "Excellent people to deal with. Extremely friendly and helpful nothing left to chance from their side add fantastic communications and there is little to touch these guys. Highly recommended and will be using again. " "Always 5 star service from Radio Facilities. Fantastic company. Thank you!" "Once again great communication from start to finish, equipment arrived promptly and is well packed for easy transportation. The set up is so easy for the theatre meaning it really helps for a smooth technical get-in. Sound quality is great and they are so reliable. This was out second hire and we are already looking forward to our 3rd and 4th!! Thank you :)"
"Great service, Great equipment that is clearly well maintained and delivered in good time. I've used Radio Facilities twice now and have never had an issue with their level of service or the equipment itself. Keep it up guys!" "The team were super helpful right from the first enquiries, I had less than a week to get the hire organised and it was no hassle from Radio Facilities whatsoever. Everything worked exactly as expected with no fuss. Courier drop-off and collection was clear and fuss-free too. Will be hiring again. Many thanks"
"Very professional people but easy to talk to. The paperwork was made to be super easy and the kit was great. All worked very well and led to a very successful performance week!" "The mics I hired were very well prepared and presented, easy to use and reliable. I have no hesitation in recommending this service. " "Always helpful. We come to Radio Facilities every time we do a musical, and they have always been great - sorting us out and willing to help show our tech students how to set up the systems and use them effectively." "Great serivce, from initial enquiry to collecting and return kit, was easy and very friendly, will be using again!" "a very professional company, communication fantastic hired 4 radio microphones was delivered a day earlier than stated all mics in very good condition with good instructions will be using these guys again highly recommended thanks and very reasonably priced." "Super helpful and very efficient - thank you "
"Equipment worked perfectly and the service overall was fantastic." "We hired wireless lapel mics and mixer at short notice for an internal event. Andrew quickly understood and articulated our requirements and provided great service at a reasonable cost given the quality of hire equipment provided. Communication throughout was excellent, delivery and collection arrangements were simple, I would absolutely use them again and recommend them to anyone looking to hire equipment." "Andrew and the team at Readio Facilities Ltd could not have been more helpful! We worked with them previsously and had terrific service and support and that's why we came back and were not dissappointed second time around! Very reliable, professional and friendly service - I'd definately recommend you.Many thanks"
"We rented a portable PA system and 2 radio mics.It was easy to use and easy to set up. The PA system weighs a lot though, so if you not strong, bring someone to help." "We have used Radio Facilities for a few years now, and the service could not be better. Delivery of equipment is timely and efficient, and it is collected on time too. The equipment is ideal for our purposes. Fantastic company!" "Excellent response, really helpful, although very busy Graham had the gear ready for me to collect within 4 hours of my initial contact, now that's what I call service!" "Always great, friendly service and the best price! " "I Hired 8 radio mics complete with receivers and personal stage mics, From Radio Facilities. I dealt with Graham who was incredibly helpful from the start to the finish of my hire, he was there to answer any questions that I had and he gave me a superb deal, by far the most competitive. I’ve worked in the TV and Film industry For over 35 years and hired equipment from many companies, Radio Facilities is one of The best I’ve ever had the pleasure to work with. Thank you Graham. " "Excellent quality at a very competitive price and great location especially for West London based businesses like ourselves. Would certainly recommend"
"The team at Radio facilities are second to none I have been using them for at least three years plus approx and I always get treated promtly and with efficiency being the key Andrew and Graham are always there for any issues if ever but I have never had any worries rest assured I am using top quality equipment at the some of the best prices available. Very friend keep up the good work guys "
"Graham and Andrews service to customers second to none....Highly recommend you use their services. Safe courier delivery and pick up a bonus. Used many times with no problems at all. 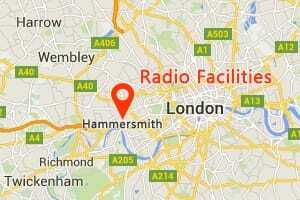 Well done to Radio Facilities.... "
"Very helpful, great comms and reliable. Will use again. Thanks Graham!" "Extremely friendly team, fast and efficient and very helpful with ensuring we got the right equipment. " "Radio Facilities have been absolutely fantastic. They were incredibly helpful, knowledgeable and efficient. Nothing was too much to ask and they were the perfect example of brilliant customer service. Always on hand, they provided us with all the information we required and the post hire service was just as good.Thank you so much." "Superb service. Very efficient, friendly and equipment was all fantastic. There was no stress involved in hiring from you guys- thank you. " "Great, straightforward, reliable service, helpful and communicative, many thanks"
"Great company, very easy to deal with. Equipment arrived as advertised, all in good working order, would definitely use again." "Very helpful, equipment arrived on time and were very flexible over collection with the bad weather and school closure. Equipment work well with no issues. Clear and easy to follow instructions were provided. " "Excellent service with expert advice and guidance delivered through every stage of the hire. Microphones suited our school show perfectly, would highly recommend." "The service from Radio Facilities was excellent from start to finish. So helpful, highly efficient, great equipment. I will most certainly be hiring from Radio Facilities again and will be delighted to recommend them at every opportunity. JH"
"Excellent experience. There was a little blip with the courier but Graham and the team were reachable and very responsive making sure everything was sorted. The kit was well organised so I just had to plug in all the mics and press record. Very Professional - would recommend. " "Friendly, professional outfit, good kit, service delivery good and convenient to the job we used them for. See you next year all being well." "The equipment arrived in good time,and very securely packaged. All enquiries were dealt with promptly and efficiently. " "After a nightmare few days and fallen through arrangements with others, I tentatively organised rental of several lav microphones. I showed up early and in a bit of a state, Graham & Andrew did their very best to help me get in and out as efficiently as possible. They are two extremely friendly & professional individuals and I would fully recommend them to anybody looking to rent equipment. " "We always have amazing customer service from Radio Facilities who are always great at communicating and willing to help.. The equipment is of the highest standard and we would highly recommend them." "Excellent service as always, with expert and helpful advice. We hire from them every year for our school musical production, and will continue to do so for the foreseeable future!" "Excellent service as on previous occasions that have hired equipment from you." "Excellent service even though you were messed about somewhat by me. The mic worked impeccably - the only thing you might want to check is the xlr cable supplied with the kit. It seemed to be a very loose fit into the receiver socket so I used an xlr cable of my own." "Great service from this company. Equipment couriered direct to us and collected again after gig. Excellent quality gear, many thanks." "Superb customer service - knowledgeable, super helpful and so easy to use! We will definitely be using Radio Facilities again! Thank you so much for your help :)"
"all positive. very helpful staff. excellent customer service. if i had to say a negative, the stuff was heavy, might be an idea to give a comparable weight indication"
"Great service and very reliable. Always delivered on time even at late notice." "As always, a brilliant service. Helpful, friendly and very professional. Will definitely use again." "Provided an excelent and fast service with great communication. Highly recommended. Many thanks for all your help."